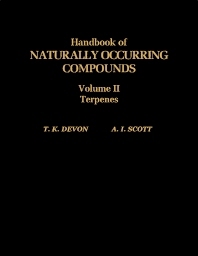 Handbook of Naturally Occurring Compounds, Volume II: Terpenes is a handbook of naturally occurring compounds to which structures have been assigned, with particular reference to terpenes. Each structure is stored in the handbook with its name, molecular formula, molecular weight, optical rotation, melting point, literature reference, and classification number. Comprised of 10 chapters, this volume begins with an overview of terpenes and their classification schemes, followed by terpenoid classes and their structural/biogenetic categories as well as skeletons: monoterpenes, sesquiterpenes, diterpenes, sesterterpenes, triterpenes, steroids, carotenoids, and polyprenoids. Miscellaneous compounds of terpenoid origin are also considered, including the ionones and fraxinellone. This final category for miscellaneous compounds of terpenoid origin arises through the somewhat frequent occurrence of oxidative degradation in terpenoid biosynthesis. In general these compounds have degraded structures such that there exists some ambiguity as to their precise biosynthetic precursors. Each individual compound possesses a compound sequence number which, in combination with the Classification Code Number, supplies a unique address for that compound. This book should be a valuable resource for chemists as well as students and researchers of chemistry.